Sew Can Do: Make Your Own Mod Melts-Style Embellishments From Glue! 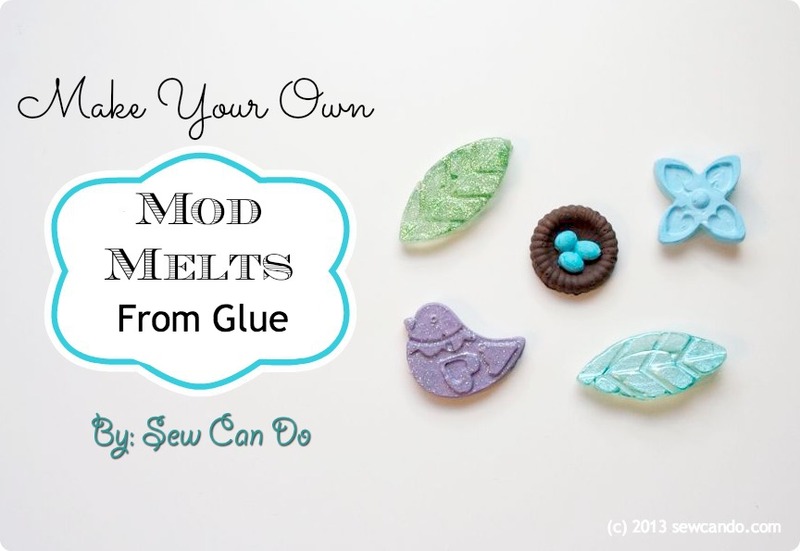 Make Your Own Mod Melts-Style Embellishments From Glue! 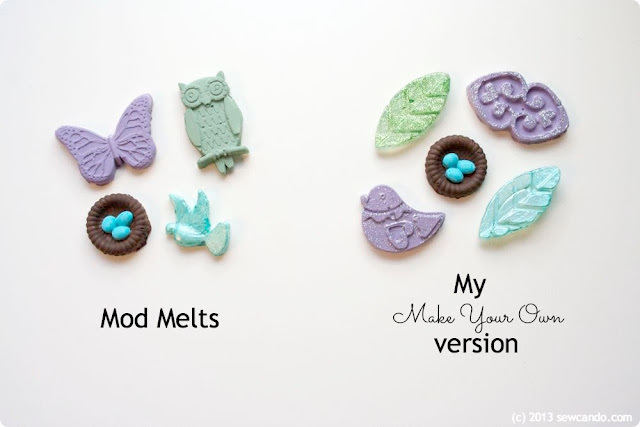 Today I'm sharing my experience using Mod Melts products to make resin-style embellishments and how to make your very own knock-off versions using hot glue instead (for a fraction of the price!). We're gonna DIY a DIY product - how meta is that? So what the heck are Mod Melts? 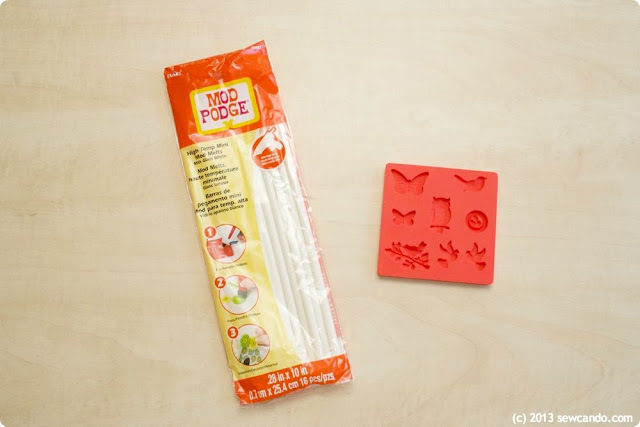 Made by Plaid (the makers of Mod Podge), Mod Melts are meltable sticks to use in your hot glue gun and melt into small-sized corresponding silicone molds. 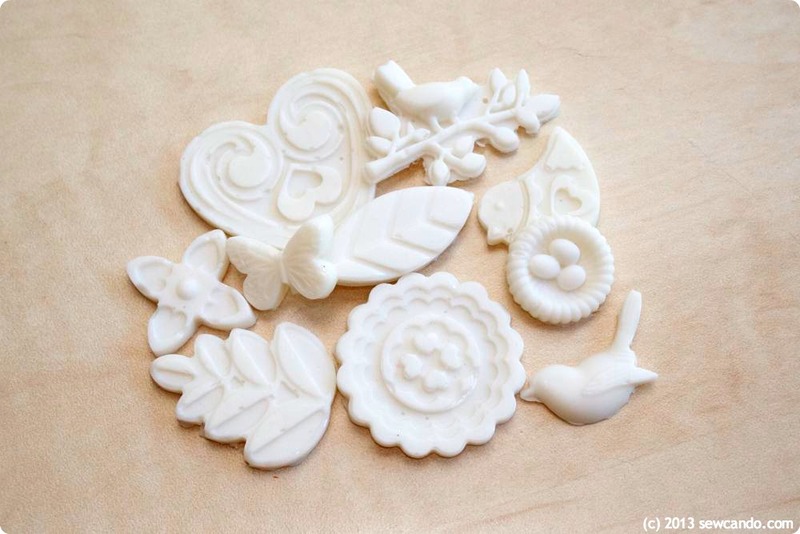 These make resin-style embellishments for to use in various crafts, scrapbooking, jewelry, hair accessories, etc. 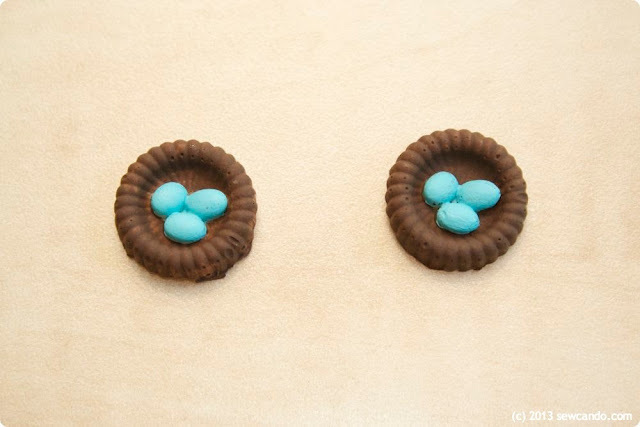 They started making the rounds on many a craft blog this year as a hot new crafting product. I was really intrigued by them - especially because you could paint them using a variety of finishes to make them custom colored, metallic, glittery, etc. No more buying big assortments of resin shapes just to get a few in a certain color or shape. And just making what you need, when you need it, sounded good. I had to wait until they finally came to my local craft store to buy some (I don't have the spare money or time to fly myself cross country to the big craft supply shows to get preview access to stuff like this). I'd wanted to get the sea glass clear sticks, but all that was left was the white. There were a few cute molds to choose from, but still kind of limited. The concept was pretty simple. Just heat a stick in a high temp glue gun and trigger the melted goo into the molds. After 10 minutes they're hardened and ready to paint. I learned you have to work super fast - the stuff sets in seconds, so it's a bit tricky to get into the little crevices in the detailed shapes and to avoid air bubbles. Opposite to the directions (that said to start in the middle), I started in the nooks and crannies after a few dud results. They started turning out better (although nearly impossible to get completely bubble free), but I noticed I went through a lot of the material pretty quick. 16 mini sticks cost about $6.99 and each mold was $5.99. 4 sticks made about 2 dozen pieces, but obviously not all turned out useable, so it does add up. The big surprise for me was that they weren't super hard like resin shapes, more rubbery, like dried hot glue. And that got me thinking...why not try that? So I did. And guess what? It worked just as well, if not better. I just used my high temperature sticks & glue gun. First plus was that the glue took a little longer to start to set, so it was easier to fill in the shapes and knock out any air bubbles. Second was that it didn't take a full 10 minutes before it could be popped out - I did about 5 minutes, so I could get painting right away. And they painted up great - I actually noticed the paint coverage seemed better on the hot glue shapes. Can you spot a major difference between them? I also noticed painting with many coats and using textures like glitter helped hide imperfections on both the Melts & glue varieties. The results were just as good with the glue. Of course there's probably some proprietary ingredients in the Mod Melts that makes them last longer or maybe their molds have slightly more details, but so far I'm just as happy with my hot glue & favorite mold combos. And price-wise, the regular glue sticks work out to be about 1/4 of the cost, so I can go crazy making embellishments and still keep it cheap. I thought this little discovery was worth sharing, so you can go DIY Mod Melts too! Your embellishments are cute. I like your suggestion about using hot glue and personal choices of molds rather than standard commercial sets. Saving money and being different from others sounds great to me! This is so brilliant. I saw all the posts for Mod Melts and really wanted to try them. Now I will skip it and just use the glue gun sticks instead! Thanks for saving me a bunch of money and frustration. Glad to share it Diana! Genius. I've been eyeing the 'melts' sticks, but I'm going to try this first! Hey this is great! I thought they were a little expensive too for what you get but glad to know there's a better alternative. Thanks for sharing! waw!! !What a great idea !!!! 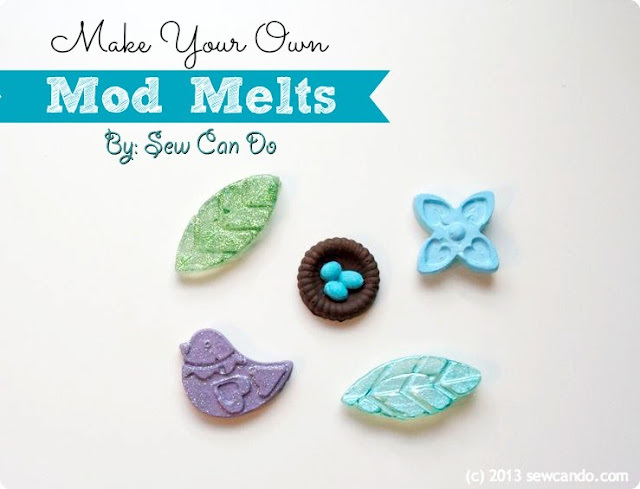 I have never heard of Mod Melts, but this looks like so much fun! 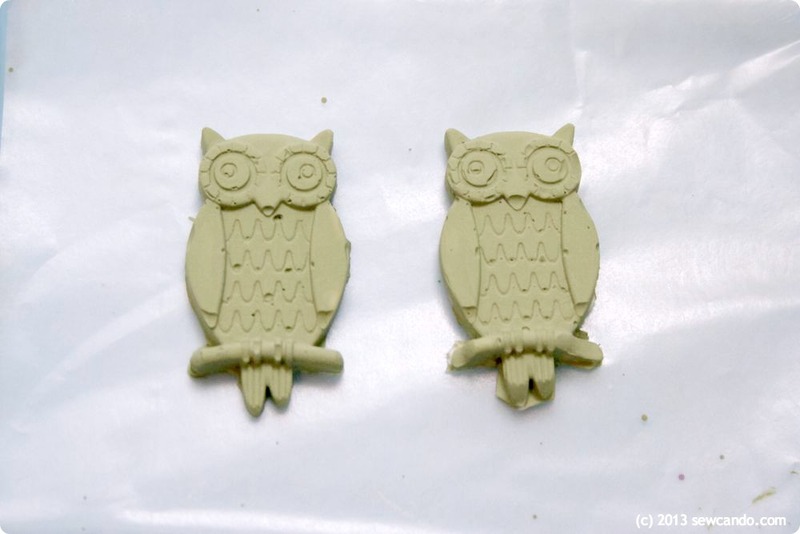 I'm going to have to try this out with my hot glue and some silicone molds i have. Great idea, thanks for sharing! I'm so glad someone tried this! I was wondering if you could use hot glue instead of the Mod Melts version, but I was too chicken to try it in case it ruined the mold or something. Once I use up the Mod Melt sticks, I'll be using regular ol' hot glue! Thanks! You are awesome for figuring this out!!! Great to hear Fiona - crafting shouldn't be expensive. It's supposed to save money from buying ready made stuff, right? Okay I know this was an 2013 five years ago but I was wondering if you do get this if you think I could use a regular pans or glass or something cuz I don't have any of those those molds you're talking about. I have like regular cupcake molds and regular. Do you have any suggestions and would it gets stuck if it's not silicon? You'd need to use silicone molds or it would be almost impossible to get them out without damaging them. 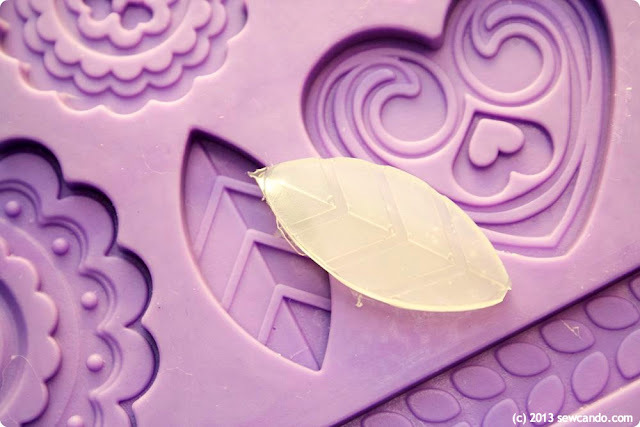 The silicone molds are easy to find at most chain craft stores - usually in the baking or soap/candle making aisles and are pretty inexpensive (especially with a coupon). Lots cheaper than the Mod Podge brand molds too. I've done that too - so much DIY fun! WONDERFUL!!! I'm all about cheap when I can get the same result! OK, how do you think putting a color or glitter in the mold before the glue would look? Oh heck, I'll just try it. It's just hot glue! :) Thanks so much for experimenting and sharing with us! You paint them after making them in the mold. They dry pretty quickly too, so you can layer your coats or different types of paint. For my purple birds I did a matte lilac color and then a silver glitter paint over it. Have fun & I'd love to see what you make! Super cool! Thanks so much for sharing! l am totally pinning! Oh I have been dying to try these! They are so cute :) Thanks again for sharing with us!! Have a great week! 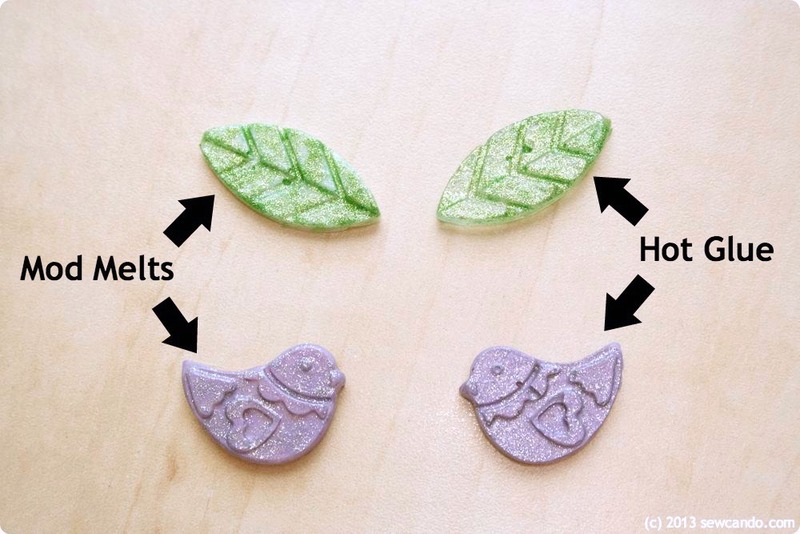 Such an ingenious way to make Mod Melts! Yours are so cute! Your embellishments are very cute! Great idea trying the hot glue sticks. I'm all for saving money. Thank you for sharing! What a fabulous idea! I haven't tried these yet, but you make it sound so easy... I have pinned this! I found you through the Craft Frenzy Friday Link Party where I have the following projects linked; Spooky Halloween Card and Subway Art Printable, would love it if you'd stop by too. 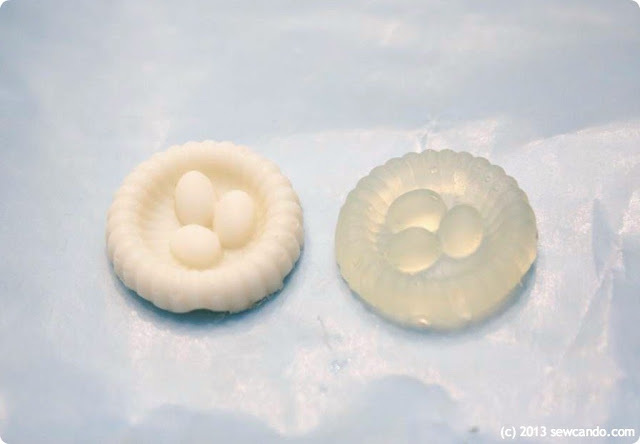 Wow, I've not seen this before and I am intriqued.Looks like I am going to have to go on a mission to find silicone molds! Too much fun. 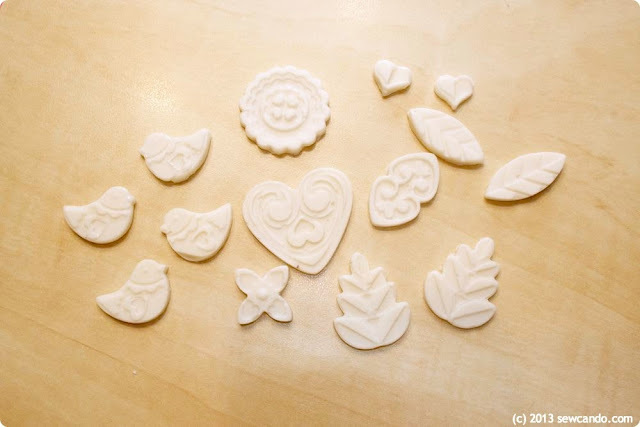 I got some good ones at Wholeport - they have a huge selection (their button is on my sidebar - on their site look under resin molds or fondant molds). its really great that the moulds work with hot glue as well. I have one question though - how do you make a hole in the melts - drill?? poke with a hot pin? I would say a hot pin or awl would do the trick. these are really awesome !!!! Great DIY of a DIY! Love the idea to be able to use other molds, too. Pinning! Thanks for sharing at Bacon Time! I used the multi-temp sticks, so I'm not sure. You might have to work quicker to fill them with the lower temp since they'll harden a bit faster. So glad to have you join me here Sherree - welcome! I love this idea. I had wondered if hot glue would work--even though I bought the Mod Sticks, I'm still going to try the hot glue, too. Also, I have noticed lately some colored hot glue sticks. I want to try them, too! Both work pretty well and this way you can practice as much as you want with the hot glue without worrying about the cost. I'd love to see how the colored sticks work - I've seen some glitter glue sticks as well. Looks like a follow-up post will be in order. I"d love to hear if you end up trying them out too! Fabulous share! I can't wait to get my supplies together and try this. I just found your site and all I can say is WOOHOO! So glad to hear that Robin. This really is a great DIY alternative to the Mod Melts so I'm happy to share it. This is great! 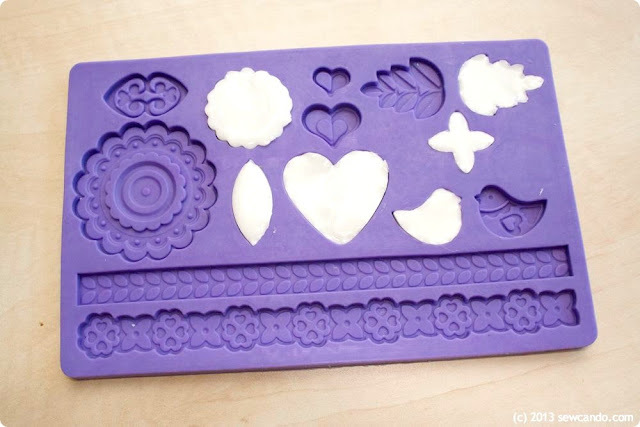 I'm going to have to try this with my hot glue gun and some little silicone butter molds that we just had laying around from my cousin's wedding! That's great to hear. It feels good to craft something new with stuff you already have doesn't it?! 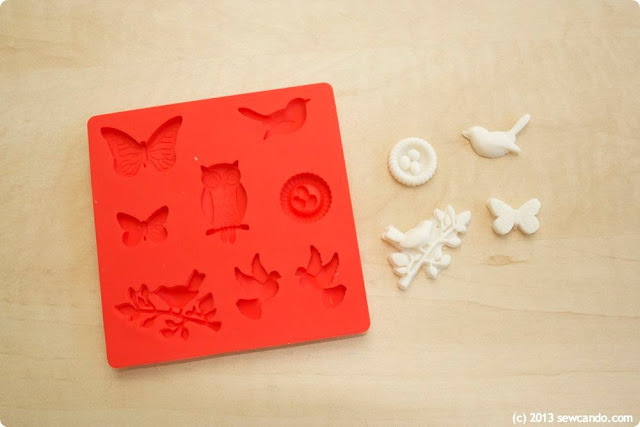 Tip: Look in cake decorating isles for more silicone molds! Ive built up a nice collection that way and sometimes you hit clearance paydirt!! Exactly! That's where I got my purple mold - lots more choices and price options. 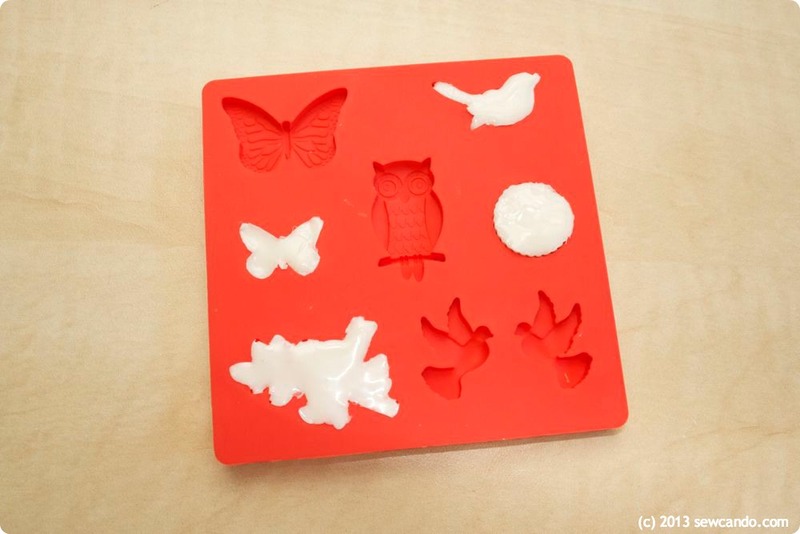 Hi Cheryl, I was wondering if you have tried using any of these melt molds as jewelry pieces and how did you do it? I haven't, but I'd expect you could probably use E6000 glue and jewelry wire with them or even glue them onto metal backings. Something to put on my to-try-out list! Hi Cheryl. Interesting!! Can't wait to try this. What colors (brand/tupe) have you used to paint? That's a great idea!! Would love to know how those turn out.